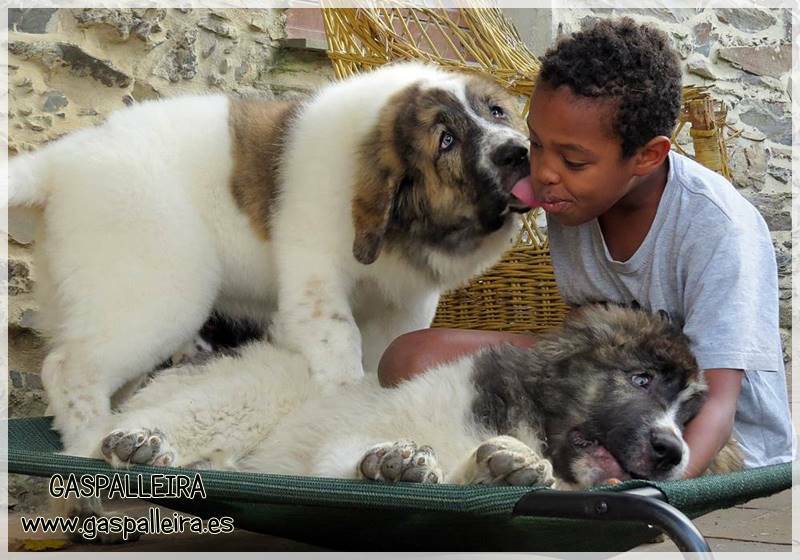 Dogs who raise puppies, raise their offspring into perfect dogs. Wolves who raise wolf puppies, raise them into perfect wolves who are prepared for a life as ´survivors´. When humans raise puppies into dogs, they run into trouble. Why? First of all, we don’t allow the puppies to get the natural upbringing that they would and ought to receive had they been brought up by other dogs. Secondly, we expect the dog to respect our human rules, which are often meaningless to the dog, and we fail to take into consideration the dog’s age, developmental stages and its capacity. The result is that the dog fails to meet our too high demands. 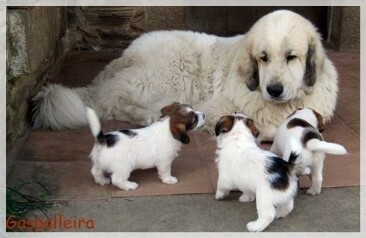 Puppies who grow up surrounded by their own kind, gradually learn to obtain the self-control they will need as adults. And they learn so well! As adults they have obtained all the self-control necessary to survive. We need to learn to raise puppies in a similar way that they would be if they were raised naturally by other dogs from birth to adulthood. The first and major mistake we do as puppy owners, is to set our expectations and demands to the puppy so high that there is no way the puppy will be able to meet them. 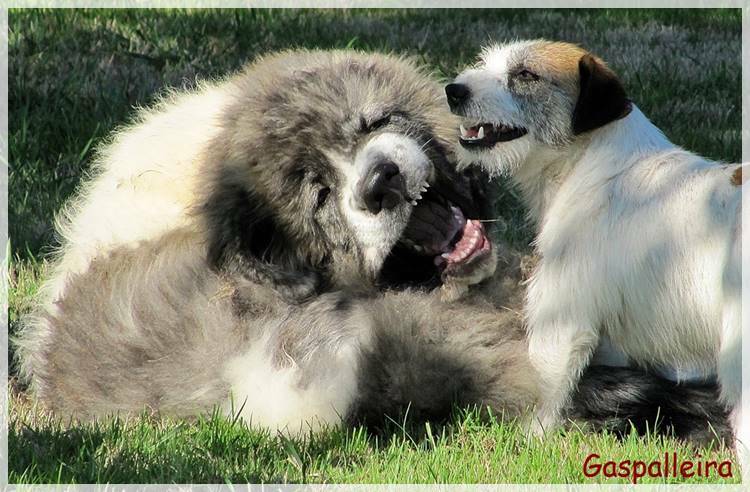 In nature and where the dogs are allowed to grow up naturally in a pack, they learn self-control very gradually. Until they are about 16-20 weeks old, they have a so-called ´puppy license´. They get to flutter their license about and say ´Na-na-na, you can’t get to me - I have a puppy license! ´. We often see how the puppies are taking advantage of this license. They bully the adult dogs around, and we can almost see that mischievous sparkle in their eyes. The adult dogs let the puppies carry on with unbelievable patience during this period of time. By 16-20 weeks of age, the puppy license is about to expire. Now, the puppies gradually need to learn to control themselves better and behave more politely. They will still be forgiven for their many mistakes and errors - after all, they are not yet adults. Adulthood will come naturally with time and experience. It may seem confusing that a puppy move from one developmental stage to another within only a few days, but we need to keep in mind that they go from puppyhood to adulthood in less than two years. In comparison, humans use 20 years before we can call ourselves adults - many need even more time than that. They have no self-control at all. They cannot control themselves when something exciting happens. Like kids who see a firetruck or dogs who smell a rabbit. Their ability to concentrate over any longer period of time is poor. While kids ´forget´ to come right home after school, the dog forgets what you asked him to do ten seconds earlier. They prefer to be with others the same age or with similar interests. They will rather play than do other things. They like action and speed. They get easily bored when nothing is happening. They find cramming boring and it takes the fun out of learning. Young dogs need training, but in short and fun sessions so that they are able to stay focused and not get tired of it. Their needs of activities can be met with short and easy training sessions on an simple agility course, recall training, taking walks in the woods, being with other dogs and play off leash, and so on. They gradually need to learn self-control, but only a little at a time. That’s why we do things stepwise, like expecting the dog to remain gradually longer in exercises like ´sit-stay´ - 2 seconds, 5 seconds, 10 seconds, etc. 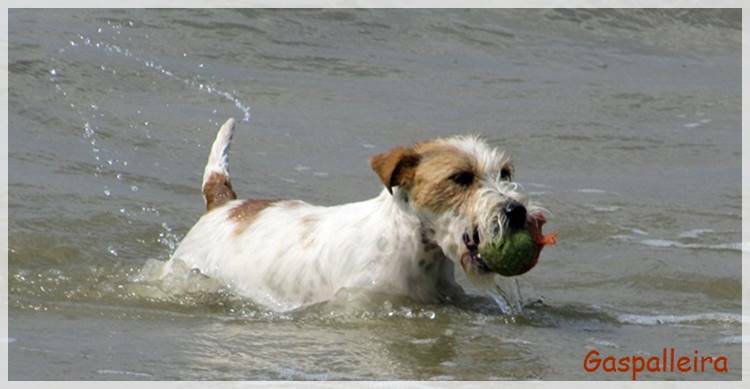 Be considerate when the dog is loosing his concentration - allow the dog to get a break in order to get his focus back, help him to continue the training. Let the adolescent dog meet with other dogs - Important! Avoid long training sessions, repeating the same exercise over and over, punishment, and so on, so that the dog doesn’t get tired and fed up with training. Socialization - Social training with people and animals is important. Teach the dog to deal with all kinds of situations in all kinds of environments. We must keep in mind that dogs are social beings who need to learn about communication, polite behavior and selfcontrol. Otherwise a life as a member of a pack will become completely unbearable. And they learn, little by little, just like human beings during childhood and adolescence. Who have ever seen a 4 or 6 year old child with self-control? When the four year old gets hysterical, there’s no point in even trying to reason with him or her. The same goes for the young dog. To try and teach them something during a hysterical fit is hopeless. We actually need to let them calm down first - before trying to teach them something. When dog owners come to class with a young dog, this dog will easily become too excited - due to new dogs, a new place, a new situation, and so on. At the same time, the class requires that the dog and owner follow a strict program of exercises, and in addition the program lasts way too long for a young dog. 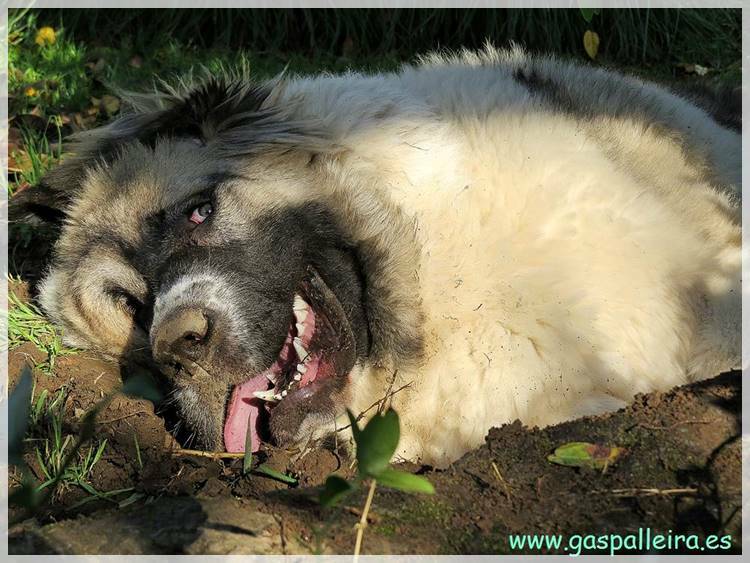 No wonder that the dog like a ´six year old´ will become agitated and even hysterical. Many, many dog owners drop out of these classes and courses because their dogs are impulsive, excited and almost hysterical. They are not ´crazy´ like the owners may be told, but their stress level is at a maximum and self-control level at a minimum. Naturally! Because, they haven’t learned how to deal with these types of situations before it’s doomed to fail. Use of violence or force to get the dog to pay attention in such a situation is unlikely to make the dog any better. On the contrary, if the dog wasn’t already in a state of hysteria, he would be if we use force and unpleasantness. It’s not our place to make our demands to the young dog too difficult. If the dog isn’t able to cope with a situation, then it simply isn’t able to cope with it. We can prevent the dog from becoming hysterical by learning to observe him and his emotional state, to learn to see that the temperature is rising and stop what we are doing before the dog has reached the level of stress and excitement where he is unable to communicate and learn. Let the dog change his position from for instance lying down or standing to the non-active position of sitting. Keep the leash loose - it needs to be so loose that it’s hanging, otherwise the dog will feel the pressure of the leash. Remember that a tight leash is the quickest way to raise the level of aggression. Don’t fight the dog. Remain calm and under self-control - How will the dog learn self-control if you don’t set a good example? When the dog is "slamming the doors"
The young dog is in a phase of transition, and there’s a lot that needs to be explored and tested. Allow the dog to explore. Allow him to get a taste of life and allow him to check things out. It’s completely harmless. We need to have boundaries, but make sure that they are set in such a way that the dog isn’t a prisoner without freedom to be active and figure things out on his own. Should he become difficult, so-called stubborn or testy, it is not because he has planned to take over the leadership or become top-dog, but rather to explore and find out how things work. A young dog will not become leader, he doesn’t even think about it. But he needs to check things out in order to see the types of reactions he will get if he ever thinks about it later. Don’t overreact! Turning your back to the dog and ignoring him is sufficient - and will say more than a thousand words. Turning the back and ignoring the adolescence is exactly what the adult dog would do. Under no circumstances should you get physical with the dog - avoid physical unpleasantness such as shaking him by the scruff of his neck, grabbing him by the cheeks while looking into his eyes, or any other cruel and frightening methods of punishment. Notice how the confident, adult dogs do it, and copy what they are doing. Adult dogs let the adolescent dog know without seeming brutal - they turn their backs and walk away. They may ´yell´, but no more than that. Is your dog growling? Wonderful! That means that he hasn’t been scared into passivity and has kept a natural part of his way of communication. Growling isn’t dangerous, it’s simply a way to let others know that he is uncomfortable. Was it something you did that provoked the dog? If so, stop provoking. Provocations can be, to mention a few; to jerk the leash, yelling and scolding, grabbing the dog by the scruff of his neck, shoving the dog, pinching the dog, taking the food from the dog, disturbing the dog in his sleep or when he’s resting, giving commands with an angry voice, demanding too much of the dog, holding the dog tightly, pulling on the leash, teasing the dog, bending over him and walking straight at a dog who’s on a leash. Was the dog frightened by something? Then avoid that he gets frightened again, otherwise his defense reaction will only become stronger and stronger. Is he only doing it to check out your reaction? Turn your back to him! He will give up immediately. In a situation like this, at least one of you needs to stay cool. Besides, it’s a given that most conflicts between dogs and owners is a result of trying to dominate the dog, not the other way around. Using ´sit´ is psychologically correct when conflict situations occur. It’s a neutral position - it’s asking for cooperation rather than submission. And to sit will come more naturally than anything else, even for an agitated dog. The dog doesn’t know which options he has. We need to teach the dog that he can choose to sit calmly instead of jumping, running around and pulling on the leash. Due to the situation, the adrenaline level in the body is high, and it makes the dog uncomfortable at the same time, as he doesn’t know what to do about it. We can show the dog and help him learn to control the situation. Move slowly. Use calm and slow body motions. Speak calmly and quietly. Your body language and behavior will convince the dog. Don’t get self-control and physical force mixed up. Self-control is voluntary, while physical force is not. Avoid shoving, forcing, pulling and pushing the dog. Keep the leash loose. The reaction to physical punishment will only be an increased stress level. Practice self-control in all situations. At first, practice in areas free of distractions, in short sessions and loose leash. Don’t have the dog sit too long in the beginning - the muscles will get tired and sore from sitting too long. We have other means of aid as well, such as the calming signals and rewarding the dog for the right behavior, only to mention a few. One day, you will have an adult dog who knows how to behave, who has self-control and who wishes to cooperate. That day will come if you raise your dog with gradually increased demands that he is able to deal with. Be considerate - your dog needs time to grow up just as we do.